Understanding the invisible capabilities and quirks of your nervous system can put you on the road to effortless control of your mind. Change its inputs through simple mental and physical exercises. Keep cool in sticky situations. Without your struggling to do so, your mind will become patient and keep your temper in control. You can avoid being shattered by grief, or guilt; conquer fear; escape from the well of sudden disappointment; avoid feeling dissatisfied with life; avoid wallowing in despair over the lack of meaning in your life. Achieving so much control over your mind is, indeed, a tall order. But, it's possible. Your resentment and despair are caused by the primal intelligences within your mind. But, while the nervous system has its primitive components, it is relentlessly logical, with an incredibly reasonable entity - your common sense - within it. You can learn to identify and empower it. Simple exercises can quiet the agitators. Reason and logic can take control of the whirr - click data flow to bring you peace of mind. It can be done. Many have done it. It will take you time to reach a stable state of mind. You will never reach perfection. But find out why it is worth a try. Your emotional problems appear to be complex and bewildering. Is there a simple answer to the question “How does the mind work?” It is an incredibly creative entity, with an immense sweep of vision. Is it a computer? Are its decisions made by mysterious cosmic forces? Are its erratic emotional outbursts the cryptic outputs of an enigmatic black box? This website suggests that an elemental answer lies behind the immense mystery of the mind. Scientists have already discovered that answer. But, mainstream science pursues a single misguided assumption. Most scientists think that nerve cells compute. They do not. They recognize patterns. The simple idea, that complex patterns can be recognized by nerve cells, uncovers the mystery of the mind. Neurons recognize patterns. Combinatorial pattern recognition can realistically store memories of everything you have ever done in your life. Every sound, smell, image, muscle movement can be remembered. Millions of years of evolutionary history can be stored. All those vast masses of data can still leave room for more. 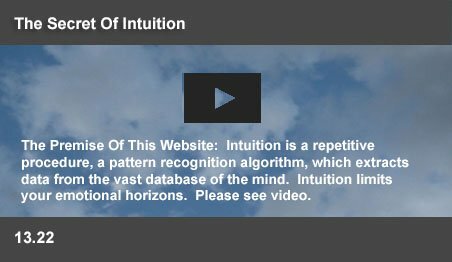 This website suggests that a simple, understandable and powerful Intuitive Algorithm (IA) applies inductive logic on the massive wisdom stored in the trillions of pattern recognition processes within the nervous system. It is a logic that can practically yield answers within milliseconds. If the mind can apply such inductive logic on a virtually infinite store of knowledge, can you still remain mystified by the genius of Einstein, or of Da Vinci? Why do we often act so stupidly, if there was so much wisdom stored within our minds? Sadly, we are victims of the foibles of IA. IA follows a simple principle. Moment by moment, it inductively applies contextual knowledge to eliminate the irrelevant. The use of inductive logic on its massive knowledge base reaches instant answers. If one neuron fires, its neighbors shut down. The nervous system is known to extensively inhibit irrelevant circuits. In practice, if an animal chooses to drink, its hunger pangs are inhibited. If the goal of a person is to destroy an opponent, IA will inhibit all his compassion for her. Emotions set the goals of the system and IA inhibits access to knowledge, which could prevent the achievement of that goal. Human misery is caused by the lack of access to all the available knowledge. Why suggest effective mind control if, in reality, IA relentlessly dishes out worries and terrors? Actually, your mind cannot be directly controlled, because it has multiple control centers, with powerful and independent intelligences. Over millions of years, evolution added increasingly sophisticated feedback systems to control animal activities. All your unhappiness is caused by the seizure of the control of your mind by its more ancient control centers. One paralyzes you with fear, another envelops you in despair. These networks switch in and convince you that life itself is meaningless. These are not vague, unmanageable entities, but precision mechanisms, which respond consistently to sensed patterns. Algorithmic processes always work logically. When, occasionally, things do go horribly wrong, your misery is triggered by these autonomous intelligences. The pattern sensing logic of the systems within your brain can be verified through simple trials and experiments. Being a mechanical system, a few mental and physical exercises can logically shut the more primitive emotional systems down. Stilling emotions frees the system. You stop feeling awful. The problems of the world suddenly lose their sting. Your present triune brain has assembled massive knowledge over millions of years in these intelligences. The highest of these is your prefrontal region (PFR), The region has the most access to your knowledge. The PFR has substantially increased its capacity in humans. This website describes ways to still the emotional control centers, so that PFR can take charge. Effective mind control is the process, where you naturally make wise decisions. You don't need to think it out. The inductive logic of PFR will do it for you. Then, you feel surprisingly good. Wise men have known these routines for millenniums. These pages explain why they work. The Buddhists had discovered methods of stilling emotions centuries ago. Do delve into the “inhibit emotions” process. While the results are welcome, the changes in viewpoints happen slowly. You have to keep exploring the strange thought patterns, which float up into your consciousness. As you scrutinize them, your system grasps its own irrationalities and begins to rewrite miles of code. That takes time. As you proceed, you will find that common sense increasingly asserts itself. Effective mind control is about letting your innate common sense decide, by stilling the incessant chatter of negative emotions. With a modicum of control, things bother you a lot less. It is a process, which will carry you into still waters. They are age old techniques, which can transform your life. These simple routines switch the control of your mind to your deepest wisdom. This website covers a few other fields too. If you look around, you will find, in these pages, unexpected answers in some areas to questions you may never have asked - Effective Mind Control, Artificial Intelligence, Future Of Computers and Robotics. Life is seldom what you want it to be. The secret is to reach that unique state of mind, where you are comfortable with whatever you have. These pages show you how to subdue troubling emotions. Begin that journey from the Mind Control Tips page. Begin with the tip on how to even out your day by not being startled by silly things. Ways of breathing can also switch off the sudden churning in your stomach when bad news phones in. That is as easy as turning off a light! The tip on relaxation is also crucial. In parallel with the physical exercises, attack the big issues in your life. Read a simple way sorting your notes to uncover your priorities. The routine will help you to understand your limitations in life. The process can be done on a spreadsheet and may take a couple of hours. But it is a nice routine, where you come to terms with the realities in your life. A simple exercise is suggested to uncover through self awareness the Rational Brain (RB) in your PFR. RB is your common sense. RB is the real you. RB knows when you stray from the truth. It gives you a “Aha” sense of relief, when you distinguish RB from the cacophony in your mind. After that, discovering yourself is a fascinating journey. At this stage, your can leave it to RB to plan your strategy to get you where you really want to be. Mindfulness exercises will keep you joyfully on target. Enjoy the journey! Get the temperamental monkey off your back! Free yourself from the tyranny of emotions. For so many people, life appears to be stupid and meaningless. They never suspect that this fathomless well of despair is the product of a hidden emotion – a mere 70 mV neural firing pattern! Those are the nerve impulses, which manipulate your moods and tense your muscles, making you perform like a puppet on string. Anger hardens your eye muscles before you even realize that you are angry. The emotion floods you with hateful memories, reminding you of all the annoying qualities of your opponent. The emotions which jerk you around are primitive control programs, designed for the jungle. They are outdated! You can learn to turn off those asinine processes. The pages on emotions can help you to walk away from their twisted logic. Despair, boredom, shyness, guilt, pride.... Learn to stop being manipulated by the survival strategies of primeval tribes. Learn why existential despair is pointless. Happiness has nothing to do with discovering the meaning of life. Learn how to be rid of painful shyness and be comfortable at parties; how to switch off boredom; how to get over sadness. A page shows you how to come to terms with severe guilt, by understanding its origins. Other pages show how you can learn to control anger.. (That knowledge will stay with you for the rest of your life). Yet another page shows how you can swallow your pride, without sinking under the table; how to move away from dissatisfaction and learn to experience gratitude to life; how to turn off the nasty voice in your mind, which decimates your self esteem. Stop the needless carping of negative emotions. Freed from distraction, your intuition will step in and guide you effortlessly through life. The viewpoints presented in these pages reach beyond the current perceptions of science. 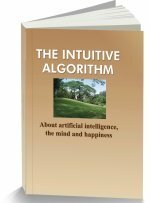 Intuition is a brilliantly simple algorithm, which powers data processing within the mind. Intuition can instantly recognize contextual patterns with molecular level accuracy. Science has identified the principle in the amazing competence of the olfactory system (Nobel Prize 2004). These pages explain how that combinatorial coding process can grant the mind a galactic memory; how the system senses the world and logically chooses options. It sees a word on this page, recognizes it as a unique entity, gathers its meaning and then moves on to the next word, before spilled coffee can hit the saucer. These pages suggest how the evolutionary process assembled a historic hierarchy of pattern recognition nuclei - a triune brain, where reptilian, mammalian and rational human level systems switch controls between each other in milliseconds. They suggest a simple experiment, where you can personally verify how the controls shift between these entities. These pages describe how the ability to recognize and trigger behavior patterns powers the mind; how the process grants empathy and understanding. How emotional behavior patterns instinctively adapt to a wide variety of survival needs; how combinatorial coding can explain the “miraculous effects” of acupuncture, acupressure and EFT. The pages describe how largely subconscious processes manage your life, with minimum inputs from you. This knowledge frees you from the backbreaking responsibility for your life. You do not manage the system. The system decides, acts and then informs you. You merely have the power to direct the attention of the mind. All the rest is mechanical. By directing attention wisely, you make the system learn and it responds with better actions. The study of Artificial Intelligence began formally in Dartmouth College in 1956 as an effort by a group of scientists to evaluate and mechanically replicate human intelligence in computers and robots. Their basic premise was that nerve cells computed. But, nerve cells do not compute. They recognize patterns. With that single faulty assumption, those early scientists followed a rabbit trail. They also woefully underestimated the memory storage capacity needed to mimic the mind. But, in February 2011, the IBM Watson Supercomputer applied pattern recognition on text data to step into Singularity, the turning point, where computer wisdom begins to overtake human intelligence. This new perspective of the mind opens up worlds of possibilities. The basic insight in this website is that the mind is primarily a pattern recognition machine, with mechanical and algorithmic processes. So, it is obvious that, one day, computers will be able to mimic the mind. The logical outcome of that possibility is that robotics and automation will largely take over life. What kind of world will that be? The Literary Agency The Book Bakers arranged to publish The Windmills Of The Mind, a book outlining the concepts in this website about the control of emotions. The Agency successfully negotiated with Leadstart Publishing to publish the book and bring it to bookstores by the end of 2016. If you have a manuscript that needs to be published and read by many, do send a mail to thebookbakers@gmail.com with a brief synopsis, an author's bio and, preferably, the first three chapters of your book. The Book Bakers can assess the work and guide you in the right direction.